It's always something of a surprise when legendary bands decide that the world has been missing their genius too long, yet after reforming for live dates in 2007, it took a further seven years for At The Gates to produce an album, their fifth. Nearly twenty years since their previous album, Slaughter of the Soul, it clearly has a massive legacy to live up to, far more so than last year's big back-from-the-ashes band, Carcass, who proved themselves easily capable of surpassing their 1996 Swansong. The cards are stacked against At The Gates before you've given At War With Reality a single listen; after all, they've been away for nearly two decades and we've been listening to countless bands influenced by them since. What does the band that revolutionised a genre in 1995 have to offer in 2014? Well, listening to At War With Reality alongside Slaughter of the Soul, it comes over as far less hook-filled, less exciting, and a lot slower. Yet there's a maturity present that suggests the same band, grown up and free of youthful exuberance. It's worth remembering that the band were in their twenties for Slaughter and are in their forties now – age doesn't have to mean a reduction in extremity (Thomas Gabriel Fischer proving that with his very existence) but it often does. Still, At The Gates more than prove that they can still blast through tracks with Death and the Labyrinth, the first song proper after intro El Altar Del Dios Desconocido, yet with the majority of faster-paced tracks here there's a distinct similarity to Made Me Do It-era The Haunted that takes a little getting used to. The Conspiracy of the Blind is a perfect example; chugging along viciously with frequent riff changes and Tompa Lindberg sounding very much like Marco Aro. Fortunately Lindberg is less one-note and incoherent a vocalist than Aro, but it's worth remembering that The Haunted put a fairly universally-ignored album out a month or so ago that's a lot more aggressive and direct than At War With Reality and just as solid. Hard, really, not to think of At The Gates as The Haunted's more intellectual older brother – lyrically, songs here range in influence from Argentinian author Ernesto Sabato to French philosopher Michel Foucault, there being depth beyond the breakdowns if you look for it. Yet on surface value alone, you could be forgiven for being bored; Death and the Labyrinth's mid-point breakdown and subsequent melodic passage sticks in the head after one listen, but other tracks make you work harder. Across the album, melodies have to be teased out, growing on you slowly – you know that Heroes and Tombs is a well-crafted song, for example, but it will take a few listens to appreciate the craftwork. 'It's a grower!' sometimes feels like what you say when you like the band but are disappointed by the album, and, well, At War With Reality is a grower. The Circular Ruins is a solid track, but feels like a retread of the title track, immediately before it, while the likes of The Head of the Hydra and Eater of Gods are practically the band on autopilot. A good, solid autopilot, sure, but surely not one that deserves the rapturous praise that some seem to be showering on this album? One of the main irritants about big bands that produce comebacks is the arrogance – not always their fault, true, but the assumptions that a) people still care and b) the music has relevance are major however big you once were. At The Gates still has a lot of fans, true, and the 'relevance' may be something for critics rather than consumers to care about, but it should still be brought up in a review of a comeback album. And At War With Reality is essentially a lesser version of Slaughter of the Soul mixed with The Haunted. It says absolutely nothing new, and those who ignored the various members' work with the likes of The Haunted, Disfear and so on can safely ignore it – let alone those who stubbornly believe Slaughter of the Soul to be overrated, the melodic death version of Master of Puppets...! Which isn't, of course, to say that At War With Reality is a bad album. It's absolutely solid, a master-class in the melodic death that they more or less invented, and those with fond memories of the band in the nineties will be rapturous. In some ways, anyone who hears a Dark Tranquillity album and immediately slaps an '85 / 100' on it (guilty!) is being hypocritical if they don't show similar faith in At The Gates. Yet Dark Tranquillity have been with us all these years, reinventing themselves and pushing at the limits of their sound in a way that always sounds fresh. And comeback albums in metal often set notoriously high bars, last year's Carcass and Celtic Frost's wonderful Monotheist great examples of bands that return to kick righteous arse. 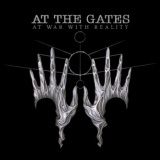 At The Gates, on the other hand, have returned as if nothing has changed, with an album that slots in naturally after Slaughter of the Soul and that would have been a minor hit in 1997 but feels out of place in 2014. At The Gates don't sound nearly as fresh and hungry as they should, and ultimately need to do a little more to truly impress.